On a lonely day in May, a five month old baby girl, blue from lack of oxygen, her heart fluttering and murmuring in ways a heart should never beat, was left at the front gate of an orphanage. 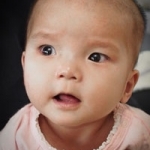 For another five months the staff at the orphanage tried to care for this frail little baby, but she was too weak and they knew that if she didn’t have surgery to repair her heart, she would not survive. October 10th, Leila joined the New Day South family. Physically Leila struggled, her heart working too hard each day to provide her body with what it needed, but Leila began to thrive in other ways. 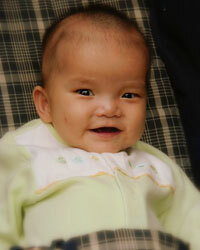 She learned quickly that she was loved and we began to see smiles and hear the most joyful giggles. 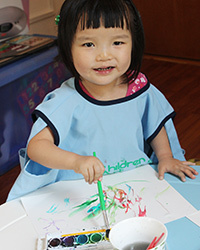 In November, Leila was admitted into the hospital. She wasn’t doing well and the doctors arranged for heart surgery right away. The surgery on November 13th went well and Leila recovered quickly. She was released from the hospital and returned home, doing well. A few weeks later, however, Leila developed bronchial pneumonia. It was right before Christmas, and Leila was admitted into the hospital again. Her heart was doing fine, but Leila’s condition was not improving. January 19th – after nearly a month in the hospital, the doctors discovered that Leila had developed a hard-to-control bacterial infection. A few days later, after running many tests, the doctors diagnosed Leila’s infection – endocarditis. 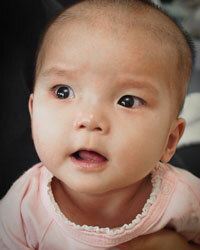 In addition she was diagnosed with Chylothorax Effusion, which in China is basically a death sentence. And so we prayed. We prayed for health and healing for Leila, that she would be restored and renewed and that her life and her recovery would be a stunning miracle, blowing the doctor’s minds and strengthening our faith. At first, it didn’t seem like our prayers were being answered. Leila’s condition remained stable through Chinese New Year. Her appetite improved, her spirits were good and her white blood cell count decreased. But still the infection did not disappear and Leila’s lungs continued to dump fluid. The doctors put her on a six-week antibiotic treatment plan, began parenteral nutrition and diet control. But six weeks later the news was not good. Leila’s veins were too fragile for the parenteral nutrition. She was developing thrombus on both sides of her groin and the doctor felt like there were no more options left. The doctor said that he would try his best, but he hinted that all of the patients he had like her in the past had died. So it seemed like our prayers weren’t being answered. Leila’s condition was now desperate… she had little hope to survive. Leila’s life was in His hand… that’s where it had been all along, and if she were to survive, it would be because He worked a miracle. The last time we had talked to the doctor he said that Leila would probably die. Now he was telling us that she could come home. When all hope is gone, that’s when the most mind-blowing miracles happen. Humbled, amazed and knocked to our knees in awe, we welcomed our sweet Leila home April 7, 2013.